We are so close to June that Finnabair's team chose a gorgeous theme for their Art Recipe this month: Secret Garden! Just think of the beautiful possibilities! You know this one is going to be good. Now let's see what their creative team put together for us! "I created my garden making a composition of flowers, twigs, and resin shapes. I painted all these elements with Impasto paints, only this time I watered them down a little, which made them behave like watercolors to create more subtle color effects." "To start off, I covered my page with Heavy Gesso to give it some strength, as I am using an altered book. Then I went in and blended the Impasto paints to create the blue/green background. Next, I grabbed some stencils and Sparks acrylic paint to create some texture. I also used Light Paste through a stencil." "Once the background was dry, I started making marks with a fine black gel pen to accentuate the stencil marks and to create some movement. I also included some hidden/scribble journaling. I fussy cut a vintage photograph from Finnabair's Ephemera Pack and glued it down, along with some embroidery floss to create a vine-like effect across the page. Next, I made some tiny red flowers using copy paper and Impasto and Sparks acrylic paints and glued them down in little bundles and along the vines." Let's wrap up our Secret Garden Art Recipe with a stunning butterfly by Karolina! 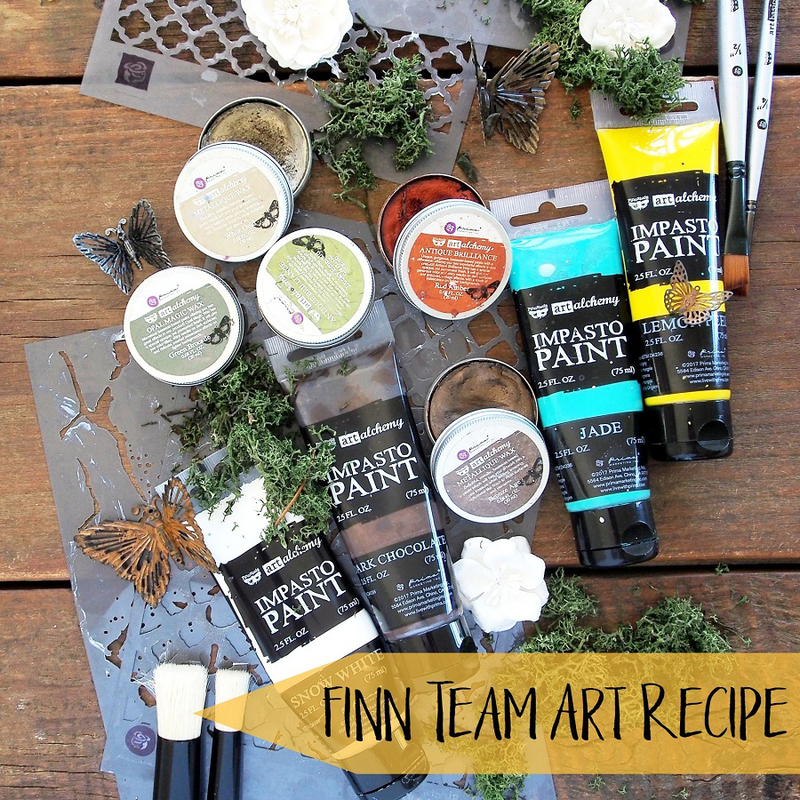 "I felt really inspired by this month's theme for our Art Recipe and Finnabair's products all three of us decided to use." "I reached for the cold colors of different Art Alchemy acrylic paints (my favorite tones: Jade, Turquoise, and White Gold) and decided to stay within a monochrome palette for my interpretation of a secret garden." 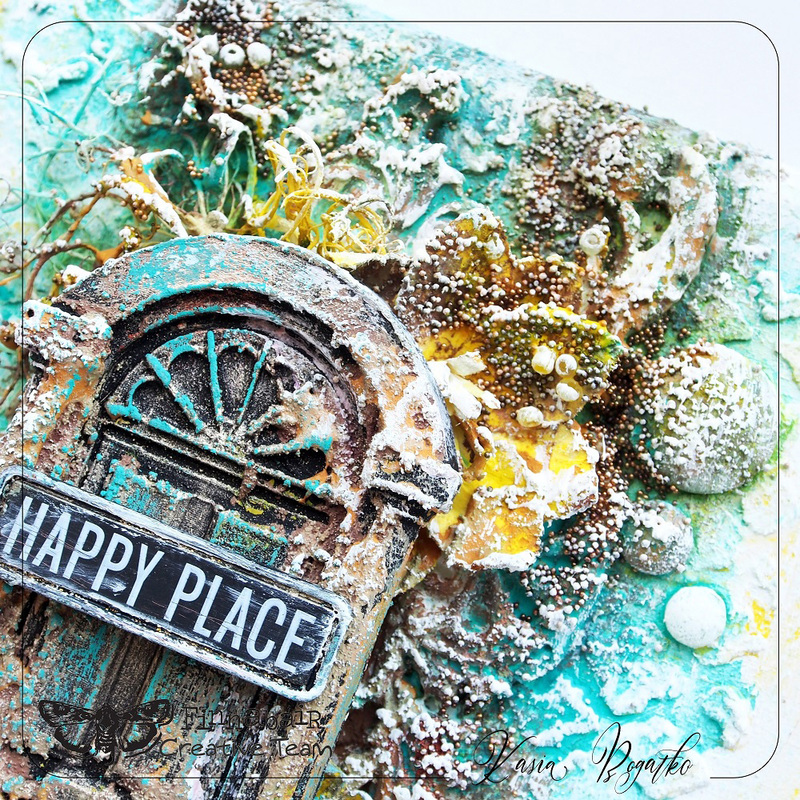 "I applied some Impasto paint through a stencil as I wanted to get a very subtle pattern. Try experimenting and use stencils with different paints and gel mediums. Impasto paints are quite thick, so they are great for this purpose." "For more delicate textural effects, I pressed some of Finnabair's stamps into modeling clay and I think it turned out quite interesting." Finn's team is always a HUGE inspiration and today's Art Recipe projects are simply brilliant. These gals work so hard for us. Please let them know how much you love their work by leaving a sweet comment below!